- "Nawazuddin Siddique in Space Part 3"
And like that, its over! 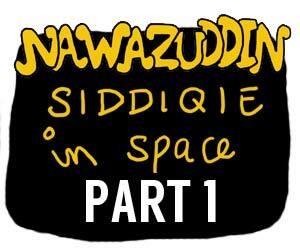 The Nawaz in space story comes to a finish! If you enjoyed it, share it! Oh and if you haven’t heard the RAFI songs mentioned in this comic, here are them. First is Duniya ke Rakhwale. A real dard bhara geet ka epic. Story of a man broken. who has lost everything. The whole Rickshawala singing Rafi, is from a real tape I saw of a jagaran, when I was little. It was beautiful. And Tum Jo Mil Gaye ho is anyday a fun classic. It has so much attitude. Oh my god. Super fun. Bahut sahi hai.